Are you new to the idea of earning passive income? Have you started earning passive income, but aren't yet earning what you would like to be earning? I have tried a lot of different ways of earning money to replace my day job. I've invested in the stock market, I've bought rental real estate, I've tried "get rich quick" schemes, I've tried network marketing. Many of these strategies work for other people, but none of them worked for me. Fortunately, I found two things that do work, and they work so well that I am not financially independent. Before you freak out and say you couldn't possibly create a book or a website, let me tell you that 10 years ago I could barely turn on a computer. I'm still a little scared of them and I want to throw mine across the room on a weekly basis because I don't understand it as well as I'd like. (Short tangent) If you're in the same boat as me, the secret is to find programs and systems that are simple and easy to use. You only need to understand the basics to create a good book or website. In fact, the geniuses out there who understand programming languages and web design are usually not the ones making passive income. They tend to over complicate things. Use that to your advantage and let your weakness be your strength. Learn enough of the tech stuff to get by and then focus on creating great content about subjects that you know and enjoy. At first it was slow going. I had a lot to learn. But I love pottery and I had a lot to say about it. I also did a lot of research so I had even more to say about it. I struggled with the technology side, but I found a web host that teaches you as you go. My love for pottery kept me going when it seemed like I wasn't getting anywhere. It took almost a year before I was making any money from this site. I started it 4 years ago and it still makes several hundred dollars per month. There have been periods of several months when I didn't even look at the site, didn't even look to see if it was making money. It was! In fact, the income has steadily grown year after year. Then, I created another website. The second one went a lot faster. It was a coffee mug review website. I LOVE coffee. But I was less passionate about the subject of coffee mugs and I started to burn out. So, instead of quit, I used some of the income from my first website to hire a writer to write quality web pages for the site. That site is now as successful as the pottery site, but with a lot less love, blood, sweat and tears invested. It seems I was getting the hang of things. I created a third website about a subject I cared very little about. It was in a niche that according to my research, was a home run for earning big ad dollars. I hired out all of the writing and waited for the money to roll in. Nothing happened. I waited some more. Still nothing. My home run turned out to be a complete flop. It never got any traffic and never earned any money. That was a big learning moment for me. The lesson was that you have to find balance; balance between passion and earning potential. If your goal is to make money and you pour your heart and soul into something that never makes money, you'll be disappointed. On the other hand, if you just go after the money, your passion won't show in your work and you'll likely still be disappointed. The key is to look for a niche that is something you love that is also profitable. How can you decide on the right niche? I have used and recommend SBI (Site Built It) for learning how to do this. They have extensive tools and guidance on choosing a niche that is right for you. I believe you could accomplish this using Wordpress as well if you are willing to use Google and YouTube to teach yourself. But if you want someone to hold your hand every step of the way, SBI is awesome! But that's not the end of the story... It gets better. One day, while I was browsing the amazing, informative forums on SBI's educational site I came across a post about how to create an Ebook. To be honest, I didn't think it was at all possible for me at my low level of technological savvy, but curiosity got the better of me and I did some more research. What if I could do a pottery book? Ever since I was a kid I had wanted to publish a book! What's the worst that could happen? Well, it "seemed" easy enough, which usually means I'll get just far enough along in the process to waste about 10 or 20 hours of my life before I hit a technological road block. This is the point where I abandon the project that "I should have known wouldn't work" and stomp around the room trying not to throw my computer out the window. 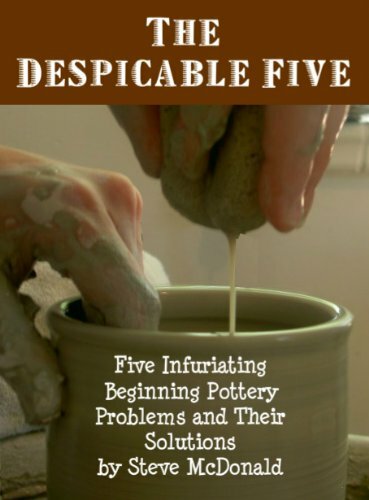 To my surprise, after about 20 hours of grueling, torturous formatting I had what appeared to be a pottery Ebook ready to be published. I clicked the publish button and it was official... I was a published author. My parents were surprised and a little proud even, and some friends were also impressed that I pulled it off. After a few weeks, the euphoria faded and I went back to working on my websites, which were actually making me money. Other than the novelty of having actually created a book, I all but forgot about the pottery book for the next six months. That is, until I noticed a payment from Amazon.com in my checking account that didn't seem to belong there. After a little digging around I discovered that the deposit was indeed correct and that it was for the sale of my book over the past months. I remember the amount being somewhere around $70.00. To my amazement the book had been selling several copies a month consistently. Clearly this was not going to make me rich, but I hadn't done any marketing or social networking or ANYTHING to keep this money trickling in. I wanted more of this. This one was MUCH shorter, 19 pages, in fact. It was a distillation of my knowledge about learning pottery from over 15 years of teaching. My theory was, as long as the information is really valuable, does a book have to be long to be good? And does it have to be long in order to sell? After a few months I found that the shorter book received better reviews and higher sales than the previous longer book. That was my moment of clarity. I needed to create short, interesting, valuable books written with an experts eye, and lots of them. The only problem was, I couldn't be an expert on everything and I dislike writing on heavily researched topics. I returned to my old idea of hiring people to write content for me. But it was important that they write from their own experience. I turned to Elance.com, which is an incredible website that connects producers of content with people who are willing to pay for content. I posted jobs to attract writers who could create short ebooks about topics that they are knowledgeable and passionate about. The rest is history. I quit my job last June and I'm now experimenting part-time with better and better ways to create passive income. Passive income is real, it's possible and these are two great ways to make it. It's not easy, but the hard work is worth it when you see that steady income stream from work you've already done! This is the book that I wrote that helped open my eyes to the possibilities of creating real passive income! Always awesome seeing these kinds of success stories - hope to be there with you soon! Interesting article. Really useful to read about other people's journeys in setting up successful online businesses. Good article, can you tell me how you go about publishing an eBook though? Say I have my book written and it's ready, what next?